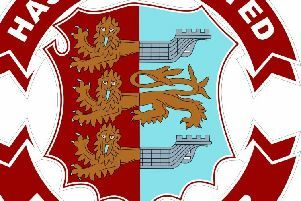 Bexhill United Football Club slipped from first to fourth after narrowly losing to the new leaders yesterday (Saturday). The Pirates’ unbeaten home record in Southern Combination League Division One came to an end with a 1-0 defeat against Steyning Town at a rain-soaked Polegrove. A tight contest between two decent teams was decided by a mistake from Bexhill goalkeeper Dan Rose, who allowed Mayckol Sabino’s 30th minute free kick to slip through his fingers above his head and into the net. Although missing defenders Lewis McGuigan and Connor Robertson, Bexhill started a match played in persistent rain very strongly and had the better of the opening exchanges. A good strike by Sammy Bunn flashed just off target, Jack Shonk fired a low shot from 25 yards narrowly wide having turned past his man and a crisply struck low drive by Jack McLean from just outside the area was well held by Steyning goalkeeper Jaime Banasco-Zaragoza. At the other end, Scott Faber drove into the side-netting from outside the box. As the game settled down after that lively opening, Steyning forward Grant Radmore glanced a header wide of the far post from Connor Bull’s cross. Bexhill striker Drew Greenall hobbled off with a knee injury after 25 minutes and Steyning grabbed the only goal five minutes later. A couple of minutes after the goal, Bull shot just wide from outside the area as Bexhill momentarily lost their way before regaining their composure in the latter stages of the half. Bexhill enjoyed plenty of possession and territory during the second half, but fashioned little in the way of clearcut chances against a Steyning side boasting the division’s best defensive record with just nine league goals conceded. Shonk was thwarted by a timely tackle from Ryan Timms as he bore down on goal seconds after the restart. McLean seemed to carry Bexhill’s main threat and he again got past his marker on the home left only to see his angled shot saved by the goalkeeper’s feet. At the other end, Rose saved from Radmore at his near post and Lewis Levoi just cleared Bexhill’s crossbar from outside the area. In the last 10 minutes of normal time, Jamie Bunn fired over Steyning’s crossbar from 25 yards before Shonk clipped the top of the bar with a speculative effort from more than 30 yards. During added time, Banasco-Zaragoza pushed Wayne Giles’ deflected cross behind diving to his right and at the other end Sammy Bunn produced a great sliding block from Levoi’s shot. Bexhill: Rose; Holden, Rea, McFarlane, Lopez (Hull 56); J. Bunn, S. Bunn, Foster; Shonk, Greenall (Giles 26), McLean. Sub not used: Ottley. Southern Combination League Division One top half standings (played-points): 1 Steyning Town 14-36 (+21 goal difference), 2 AFC Varndeanians 14-35 (+26), 3 Alfold 15-35 (+24), 4 BEXHILL UNITED 15-34 (+37), 5 Selsey 15-27 (+12), 6 Hailsham Town 15-26 (+22), 7 Seaford Town 14-25 (+5), 8 Wick 14-21 (-2), 9 Littlehampton Town 15-20 (-5).